One of the things my husband has long had difficulty with is the idea of our son receiving toys for his birthday and for holidays. Even when our son was a baby, my husband had a hard time, since children outgrow toys. Sure, they are a lot of fun, but they don’t offer regular returns, and once they are broken or outgrown, children no longer benefit from them. A relatively new company can change that, though. Instead of giving consumer items, what if you took the money you would have spent on a toy, and instead invested it each year? That’s the idea behind TrustEgg. TrustEgg is easier to set up than a savings account, has the protection of a trust, earns a market rate of return, is more flexible than a 529 plan, and can be opened with as little as $1. The added social element lets people leave messages, creating a virtual time capsule for recipients to look back on – and makes sure the gift doesn’t go unnoticed. Later, the money that has accumulated in the account can be used for any number of purposes, from a college to a wedding. This might actually prove far more valuable than a toy. Take the cost of a toy, and invest that money each year, rather than buying a birthday present, and the results could be quite dramatic. 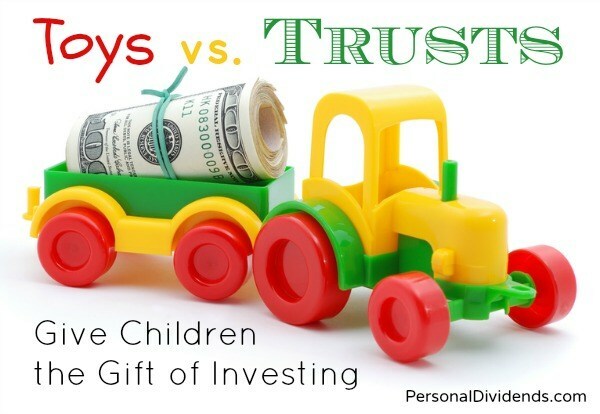 If you were to give a one-year-old $24.98 instead of a Fisher-Price toy, according to TrustEgg, and continue to invest $24.98 each month until the child turns 18, the end result would be $8,831 at the end of those years, assuming a 6% rate of return. Even if you only invested once per year, you’re looking at a final amount of $810.37. That’s not too shabby. Consider, if you bought a gift of $24.98 each year for 18 years, you would spend $449.64. Spent on consumer items, that money does little good long-term. Invested, though, that money has the potential to grow to much more than you spent. That’s something that a child can really use. TrustEgg also estimates that you could help a child save up more than $32,000 by investing $100 a month for 16 years. It is important to carefully consider before you invest, however. You need to make sure that you understand the ins and outs associated with any account. Check to make sure that you understand how the trust works, and whether or not it is the best setup for you and the child. You also need to realize that market conditions can change. You might not get the return you expected, or the market could crash just before the money is needed. It’s important to keep this mind as well. However, chances are that the child will still come out ahead. What do you think? Would you rather give a toy? Or something that keeps on giving?